A Witch mixes a brew in a cauldron during a sabbat, 1687. Courtesy Fortean Picture Library. In pagan tradition, the cauldron is the Great Mother's cosmic womb. In Celtic lore the cauldron, as a symbol of and source for hospitality, had an almost religious significance. Life, in the form of food, came from the cauldron. The Gundestrup Cauldron was discovered in a peat bog in Denmark's Jutland in 1891. Made of embossed silver piece and twenty-seven inches wide at the rim, it dates from the first century BCE. Scholars believe it was taken from Central Europe to Denmark as war booty. The intricately detailed panels of the cauldron relate the Irish epic Táin Bó Cuailnge. In ancient Britain, cauldrons featured in many religious mysteries. obtained his power from three cauldrons in the cave-womb of the earth. He entered in the form of a phallic snake and beguiled the earth-goddess by making love to her. In Finnish folklore, a magic cauldron was the source of all things on earth. It was called Sampo and was located beneath a fairy island. At Vix, in France, a Greek bronze cauldron was discovered. It is known as a krater, and dates to about 500 BCE. It was found, with many other treasures, in the grave of a Celtic princess. Medea, the Witch of Colchis in Greek myth, was a priestess of Hecate, goddess of the Moon. Medea had a cauldron and an entourage of twelve maidens, who helped in her rituals with the cauldron. There are many stories of kings and others being boiled in the goddess's cauldron and then being reborn. They included King Aeson, King Minos, Pelops, son of the king of Phrygia, among others. One goddess closely associated with the cauldron was Kerridwen, ancient British fertility and mother goddess. A magical draught brewed in her Cauldron of Inspiration gave the recipient knowledge and inspiration. The brew had to simmer for a year and a day before it was ready. Branwen, another British goddess, had a Cauldron of Regeneration in which dead men could be brought back to life. Huge magic cauldrons were supposedly owned by several of the Irish and Welsh deities and their theft by semi-divine heroes is a popular theme of the early myths. The five feasting halls, or bruidne, of ancient Ireland each possessed a magic cauldron that duced just enough food to feed however many people were present. The cauldron is invariably associated with Witches in the popular mind. The cauldron around which the three Witches of Shakespeare's Macbeth danced may be partly responsible. Certainly Macbeth is the source of the image of Witches throwing into the cauldron strange and grotesque items, such as "fillet of a fenny snake, in the cauldron boil and bake; eye of newt, and toe of frog, wool of bat and tongue of dog, adder's fork, and blind worm's sting, lizard's leg and howlet's wing. . . ." Shakespeare was obviously heavily influenced by the Church's distortion of the Old Religion. Yet there was some substance to the idea of Witches using cauldrons. For the great sabbats, when large numbers of Witches got together to worship, many of them had to travel a considerable distance to reach the sabbat site. They drove along with them chickens, ducks, or geese, and carried a large cooking pot or a cauldron. At the site they got water from a stream, gathered local herbs (the seemingly obnoxious ingredients), and cooked up the fowl. 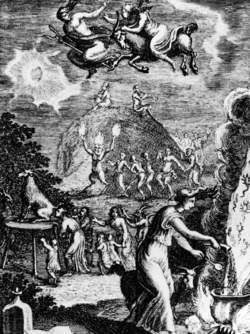 So Witches did indeed have cauldrons at the sabbats—but not to boil up babies or the like! Torchbearer Rosie Smith lit the Paralympic ceremonial cauldron in Edinburgh yesterday as another band of talented Scots men and women bid to follow our Olympic heroes and write their names in sporting history. We were aware cauldrons had been getting bigger, higher, fatter as each Olympics happened and we felt we shouldn't try to be even bigger than the last ones," the Daily Mail quoted Heatherwick, as saying. It is one of eight Cauldrons & Furnaces events at Cadw sites until July 17 in a partnership between the Welsh Government's historic environment service and the Arts Council of Wales. The project is part of Cauldrons & Furnaces, a series of high-profile events which have been introduced by the Welsh Government as part of the nation's Cultural Olympiad project. The experiment proved that the characteristics of brown coal are in line with the systems at the TPP's cauldrons and are a good alternative to the ones used so far. One horse was slaughtered, 3 cauldrons of meat and 2 cauldrons of pilaf were cooked. He said some visitors were asking for amulets from them, others drop money in the cauldrons while some others forward to the Mazar (mausoleum) and pray for their wishes and desires. Parents in Puyallup, Washington, have been told broomsticks and cauldrons might upset followers of the Wiccan religion living in the area. WE have got 10 cauldrons to give away in a magical Harry Potter Caudron Competition. And whereas past cauldrons only showed the tip of the flame flickering above the rim, this one culminated in a see-through glass chalice that revealed "The Fire Within. The must-stock merchandise this autumn will be a range of Harry Potter-inspired cauldrons, potions and magic wands, according to Grosvenor of London which showcased its new licensed range at the CRS. JUST WILD ABOUT HARRY ..
Pisco still involves copper cauldrons and the traditional shape of the alambique, or still, has not changed in centuries. "The Devil of the Andes"